It’s officially holiday party season, and no matter how much we all know we’re not supposed to talk about our diets at the table, the reality is that almost everyone does. This can sometimes be exciting (a chance to introduce Paleo to someone who could benefit from it), but it can also be very frustrating if you try to explain your diet to people who insist on confusing Paleo with something else: the “isn’t that like Atkins?” conversation. You don’t have to know a whole lot about Atkins to realize that it isn’t like Paleo. But it does help to at least have a rough idea of what you’re talking about – and reading about other diets can even give you a chance to learn something new. Obviously, not all diets are equally healthy, but most of them have something valuable to teach us (if only as an example of what not to do). In this article, you’ll find a road map to four diets commonly confused with Paleo: the Atkins Diet, the Slow-Carb Diet, the Blood Type Diet, and the Mediterranean Diet. 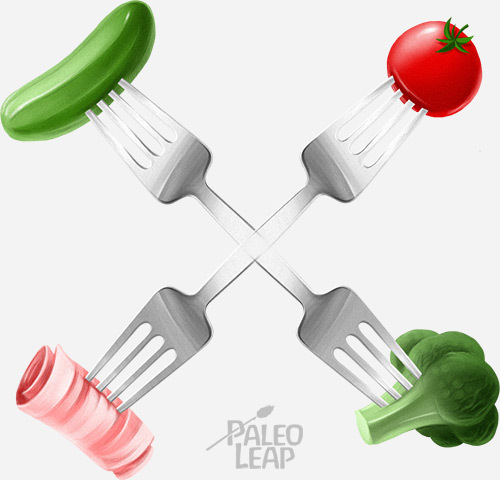 Learn what they are, who came up with them, and how they stack up from a Paleo perspective. None of these approaches is optimal from a Paleo standpoint, but all of them have at least something interesting to consider. The Short Story: a very low-carbohydrate diet will put you into ketosis, allowing for rapid and relatively painless weight loss. The Long Story: If you say anything about limiting wheat or refined carbs, the first diet that comes to everyone’s mind is Atkins. Developed by Dr. Atkins in the 1970s, the Atkins diet is about achieving dramatic and rapid weight loss by restricting carbohydrates. The goal of Atkins is to first get into ketosis, and then gradually work up to a level of carbohydrates that still allows you to lose fat or maintain your weight. Compared to Paleo, there is some overlap between the foods to include (meat, vegetables, and fats) and the foods to avoid (grains), but in the end Atkins is a diet for weight loss, while Paleo is a diet for health. Accordingly, Atkins is focused primarily on macronutrient ratios, while Paleo is focused primarily on food quality (eating plenty of nutrients while avoiding toxins). Paleo can be low-carb, but it doesn’t have to be. This is obvious when you look at what the Atkins diet does include. Atkins dieters are allowed to eat soy, industrial seed oils, and even small amounts of grains in the later phases of the diet, if it doesn’t affect their weight loss. The current version of Atkins also allows all kinds of processed junk foods, as long as they’re low-carb. There’s even an entire company, Atkins Nutritionals, Inc., dedicated to selling Atkins-friendly packaged foods. (Take a look at the Atkins Endulge Chocolate Caramel Mousse Bar – low-carb it might be, but health food it isn’t). There’s no focus on reducing your psychological desire for candy and junk food or retraining your taste buds to appreciate real food; high-carb junk is just replaced with low-carb junk, and as long as it doesn’t stall weight loss, it’s fine. So even though it’s theoretically possible to eat a Paleo diet that complies with the Atkins macronutrient profile, the two diets represent radically different ways of thinking about food. Atkins is focused on low-carb food whether or not it’s junk; Paleo is focused on healthy food whether or not it’s low-carb. The Lessons: The meteoric success of Atkins in 2003-4 and its subsequent crash in popularity in 2005 demonstrate the problems of a diet that requires you to obsessively count and track anything, whether it’s calories or carbs. That level of effort simply wasn’t sustainable for most people, and dieters abandoned Atkins in droves when they realized they would have to tally up grams of carbohydrates for the rest of their life, or risk regaining all the weight they’d originally lost. In other words, what we can learn from Atkins is that you shouldn’t make eating such a chore! Paleo doesn’t rely on that kind of carb-counting (or calorie-counting, or anything-counting), but it’s easy to get caught up in worries about Omega-6 fats or glucose:fructose ratios and end up abandoning the whole effort because all the numbers you “need” to keep track of are so overwhelming. Don’t fall into this trap. Paleo is healthy without requiring any of that; take advantage of it, and enjoy your food instead of stressing about numbers. The Short Story: Eat boring food, and you’ll eat less. Add a cheat day once a week for sanity. Avoid white carbs: In this category, Ferriss puts everything that is (or can be) white, including grains and dairy. Most of this is very Paleo-friendly, but two favorite safe starches (white potatoes and white rice) are slow-carb verboten. Dairy is also prohibited under the “white carb” rule, but in the Paleo world, it’s a gray-area food that isn’t automatically off the menu. Here, the difference is that slow-carb is focusing on maximizing weight loss, while Paleo is focusing on optimum health. Keep repeating meals: This is supposed to make the diet very boring, so you don’t even want to overeat. It’s true that variety isn’t necessary for a good diet, but from a Paleo perspective, it definitely isn’t bad, either. If you like eating the same foods again and again, that’s fine, but if you find that boring, Paleo actually encourages you to try for variety and excitement in your meals, so you don’t run back to processed foods in despair. In particular, it seems like the slow-carb list of vegetables unnecessarily restrictive. Don’t drink your calories. Not much argument here. In general, water, tea, and black coffee are the Paleo fluids of choice, and most of the alternatives are out. Don’t eat fruit: Paleo isn’t nearly as prescriptive as “don’t eat fruit,” but fruit is more of a “healthy treat” food than a diet staple. It’s true that a lot of people going for weight loss find it very useful to cut out fruit, so this rule is reasonably compatible with Paleo. One cheat day per week: this is supposed to be your reward for sticking to the boring, repetitive meals the rest of the week. It gives you something to look forward to and a reason to stay on track. On your cheat day, the idea is to eat as much as you can of whatever you want – pizza, pasta, ice cream, chocolate bars…save up all your cravings for that one day and go wild. This is where the slow-carb diet really diverges from a Paleo approach – on Paleo, occasional treats are encouraged, but scheduling an all-out binge once a week is definitely not: this is a surefire way to make sure your food cravings never disappear. Ultimately, just like Atkins, the Slow Carb diet is all about weight loss, not health. Paleo is a general, customizable approach that optimizes health for a broad spectrum of people. The Slow Carb Diet is a very specific, rigid approach designed for maximum weight loss with a minimum of effort. Paleo is about learning to enjoy your new diet, adding plenty of tasty and healthy fats and a variety of fruits and vegetables so you don’t feel the urge to “cheat.” Slow Carb isn’t about this kind of long-term shift in eating habits; it’s just white-knuckling the pain for 6 days to get your reward on the 7th. From a Paleo perspective, that’s the real issue with the Slow Carb Diet, not the inclusion of legumes or the exclusion of white rice. The idea of “hacking” your body to achieve certain specific goals is incredibly tempting, but ultimately health is about more than weight loss, and the seesaw between binging and restricting isn’t healthy no matter how carefully you schedule it. The Slow Carb Diet doesn’t give you space to change your emotional relationship with food from one based on punishment/reward to one based on nourishment and respect. The Lessons: That said, there are a lot of interesting aspects to this diet. The repetition of meals is a very interesting and potentially useful to reduce food reward, and also to save cooking/food prep time. A low food reward version of Paleo might be exactly what some people need to really break free from the idea of food as entertainment, and it’s definitely valuable to have a few “go-to” recipes that you don’t need to turn on your brain for. The most valuable thing to learn from the slow-carb approach is the need for self-experimentation. When Tim Ferriss wrote the book, he did all the research on himself. This willingness to be his own lab rat gave him a lot of important information about his own personal biochemistry, and allowed him to come up with a diet that met his own individual needs. Obviously not many of us are going to do as many tests as he did, but his example is a great “how-to” for performing relatively controlled N = 1 experiments that actually help you improve your diet. The Short Story: Your blood type can guide you towards the healthiest diet for you, based on your evolutionary history. The Long Story: The Blood Type Diet is based on the idea of genetic individuality – since we’re all biologically different, no one diet or lifestyle will work for everyone. Dr. Adamo classifies people by blood type, claiming that blood type determines how you respond to lectins in your food. According to this theory, a Paleo diet is appropriate for people with Type O (the “most ancient” type), a vegetarian diet for people with Type A (descended from agriculturalists), a meat/dairy based diet for Type B (descended from nomads), and a mixed diet for type AB (the “most modern”) type. Before really evaluating this diet, it’s important to know a little bit about blood type and the immune system. There are four major blood types: A, B, AB, and O. Each blood cell carries antigens as a kind of ID card to identify it as one of the four types. As part of your immune defenses, your blood plasma is full of antibodies, which attack cells of any blood type except for yours. For example, people with Type A blood have anti-B antibodies that will attack any Type B blood cells that get into their system. If they get a blood transplant from someone with Type B, they’ll die, because their body will attack the blood. Type O blood cells have no antigens (no “ID card” identifying them as any particular type), so Type O is the universal blood donor because no set of antibodies will attack it. On the other hand, Type O blood itself contains antibodies to both A and B, so people with Type O blood can only get blood transplants from other people with Type O blood. Type AB blood cells have antigens identifying them as both A and B, but no antibodies. This makes Type AB the universal recipient of blood, since Type AB blood plasma won’t attack anything. This is useful information because it lets us critically evaluate Dr. Adamo’s evolutionary theory about blood types. The evolutionary approach seems to complement Paleo theory fairly well at first, but unfortunately, Dr. Adamo is probably wrong about his chronology. Actually Type A is the oldest, and both Types A and B must have evolved before type O, since people with type O blood have antibodies to both type A and type B. If type O evolved first, how could it have developed defenses (anti-A and anti-B antibodies) against threats (A and B antigens) that didn’t even exist yet? In other words, the evolutionary approach behind the diet is completely flawed and the recommendations based on it are unlikely to improve your health. Another problem with the blood type diet is the insistence on avoiding certain kinds of lectins. Lectins are proteins found in all foods, but especially in vegetable foods. Some lectins are perfectly harmless, and others can be gut irritants; the lectins found in grains and legumes are one of the main reasons why a Paleo diet excludes all of these foods for everyone. But the blood type diet takes this even further. Dr. Adamo claims that eating a type of lectin incompatible with your blood type will cause a kind of immune response against it based on the antigens in your blood. Like a transplant of the wrong blood type, a dietary lectin of the “wrong type” will cause an immune reaction. To destroy the “foreign invader,” your blood cells will clump together around the lectin (agglutinate), and cause all kinds of chronic diseases. There’s a tiny grain of truth here – lectins do have some blood agglutinating properties. But Dr. Adamo’s theory fails where he tries to connect this to blood type. In fact, the vast majority of lectins are not blood type specific. Some are agglutinating and others aren’t, but almost all of them cause the same reaction across all blood types. Supporters of the Blood Type Diet like to point to studies showing examples of agglutination in different blood types, but most of these were done by injecting pure lectins into blood in test tubes, which is just not relevant to the real world. The nail in the coffin of Dr. Adamo’s lectin theory is the simple fact that lectins shouldn’t be in our bloodstream at all. They only get there if you have a leaky gut, an abnormal permeability of the intestinal wall that allows undigested proteins like lectins to sneak through the gut lining to begin with. Real health isn’t about determining which lectins you do or don’t react to (based on blood type or anything else); it’s about keeping the lectins out of your blood in the first place by healing your gut. So if the Blood Type Diet is so unscientific, why do so many people report such amazing results? In part, because Dr. Adamo recommends a basically Paleo diet to Type O, and eliminating wheat to almost everyone. He also suggests cutting out processed foods and refined grains. Obviously, these changes will bring some significant benefit to everyone who tries them, but it has nothing to do with blood type! The Lessons: The Blood Type Diet isn’t even a plausible complement to Paleo. But we can learn one thing from Dr. Adamo’s approach: it does maintain a valuable focus on the individual person (finding what works for you) that’s easy to incorporate into a Paleo framework. Knowing your own evolutionary background can be practically useful. In an obvious example, people with darker skin need to spend more time in the sun to get enough Vitamin D, because they evolved to thrive in sunnier climates. People with Scandinavian ancestry are more likely to tolerate dairy well. Knowing where your genes came from is valuable for your health even though the blood type diet specifically is flawed. The Book: There is no one “book;” the Mediterranean Diet was inspired by research into the traditional diets of countries that border on the Mediterranean Sea (mostly Greece, southern Italy, and Spain). The Short Story: People in these countries enjoy generally good health, so imitating their big-picture dietary patterns is likely to be healthy. Olive oil as a staple fat source: mainstream researchers love it because it isn’t saturated fat; Paleo dieters love it because it isn’t PUFA. In other words, we think it’s healthy for different reasons, but we both agree that it’s good for you. Whole grains and legumes (lentils, chickpeas, and others): this isn’t Paleo, but on the other hand, whole grains and legumes are a lot preferable to refined and processed grains and junk food. So from a Paleo perspective, this would be a “less-bad” aspect of the diet that makes it superior to the standard American diet even though it’s not ideal. Fruits and vegetables: no argument here from anyone; fruits and vegetables are just plain good for you. Fish: again, the Mediterranean Diet gets no disagreement from Paleo here. Seafood is incredibly nutritious, and getting it locally (as the Mediterranean folks probably are) is the best way to go. Moderate dairy consumption, especially fermented dairy (cheese and yogurt): dairy is a Paleo gray area, but if you’re going to eat it, fermented dairy is the best. Low consumption of red meat and eggs: here’s where Paleo really diverges from the Mediterranean Diet. From a Paleo perspective, the relatively low red meat consumption isn’t a cause of Mediterranean dieters’ good health. On the other hand, avoiding these foods probably isn’t doing them any serious harm given their high consumption of fish and seafood, which provide an alternate source of high-quality animal protein. So it’s somewhat of a wash. Overall, the Mediterranean Diet has a lot going for it. It’s certainly better than the standard American diet; not even Paleo dieters would argue with that. And it has a lot of commonalities with Paleo, particularly the emphasis on whole, fresh foods. Ultimately, though, the Mediterranean diet just looks at a group of people who are healthier than Americans (not hard to find!) and describes a diet that’s comparatively better, not necessarily a diet that’s optimal. The Lessons: The biggest thing to take away from the Mediterranean Diet is the focus on the big picture. Instead of focusing on just one part of Mediterranean food, the diet tries to re-create the entire food environment. This is useful, because foods often interact with other foods, so just aping one particular aspect of a healthy person’s menu isn’t usually the way to improve your own health. Instead of getting stuck in the search for the “perfect food,” the Mediterranean diet is a useful lesson in looking at the entire food environment, and finding foods that all fit together for a healthy menu overall. In fact, a lot of the literature on the diet also stresses non-food factors, like the role of regular physical activity and time spent outdoors – certainly nothing to sneeze at when you’re considering overall health. Thinking of all these diets as opportunities to learn something can help you have more pleasant and friendly conversations about them, since you can acknowledge that they do have good points instead of simply focusing on the bad. When you’re stuck in a diet argument, complementing some aspect of the other person’s diet is often the quickest way to find common ground, so you don’t just end up yelling at each other. This works even if you ultimately disagree.